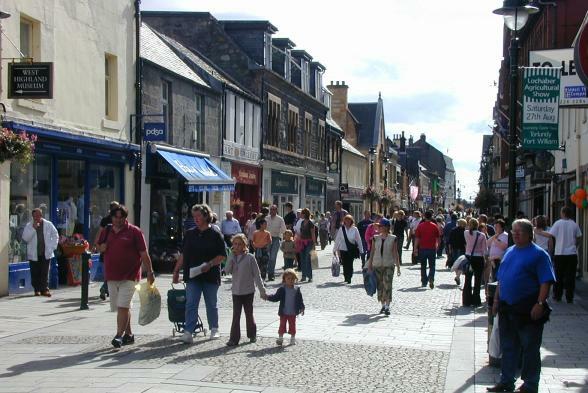 Fort William High Street @ High.St - High Street shops and High St businesses. Large Google map of Fort William High St.
Fort William is the main port of call for those visiting the West Coast. The numerous outdoor shops on the High Street reflect the nature of the area, from climbing Ben Nevis, UK's highest mountain, to world class mountain biking trails. The West Highland Way ends here, a beautiful trek of 95 miles (150Km) that starts at Milngavie to the North of Glasgow. A list of all these activities are listed on the outdoor activity website. The world's largest indoor ice climbing facility, Ice Factor is just down the road at Kinlochleven; instruction is available if you have never tried this exhilarating activity before. For those not into extreme sports, the area still offers some beautiful scenery and a relaxing atmosphere. The mountain gondolas can whisk you up the Aonach Mor to 2150ft (655m) for excellent views of Ben Nevis and the Great Glen. The Jacobite Steam Train, famed for its connection to Harry Potter, leaves from Fort William on its spectacular journey to Mallaig. Alternatively, Ben Nevis Distillery is a good place to start on the Whisky Trail around Scotland.